Wish 1.) A Revolutionary Algorithm. It is universally agreed, that a new algorithm is essential to handle the increasing complexity of geometries presented for analysis in today's engineering arena. Hanley Innovations Surface Treatment (HIST) is the propriety algorithm developed to respond to the uncompromising demands of your research. With HIST powering Stallion 3D, you can perform serious external CFD on your laptop at work or home. HIST handles complex CAD geometries, subsonic, transonic and supersonic regimes and viscous (no-slip) boundary conditions. Today's standard CFD workflow process for analyzing an object requires expert juggling of several different software packages. Stallion 3D with HIST is seamless and is the only 3D program that completely sets-up... in seconds. Stallion 3D with HIST eliminates the need for you to learn how to mesh and overlay grids, pay for extra software, and spend days in training just to get your work completed on time. Everyone understands why CFDers need invisible meshing in their CFD program. Stallion 3D's invisible meshing capabilities, affords the CFD community the opportunity to focus on other aspects of their workload and research, rather than taking hours and subsequent days setting-up a CAD geometry. Stallion 3D with HIST is genuinely invisible, and most importantly, our results correspond to validation wind tunnel testing runs from NASA, so there is no stress in wondering about the accuracy of your results derived from our program. 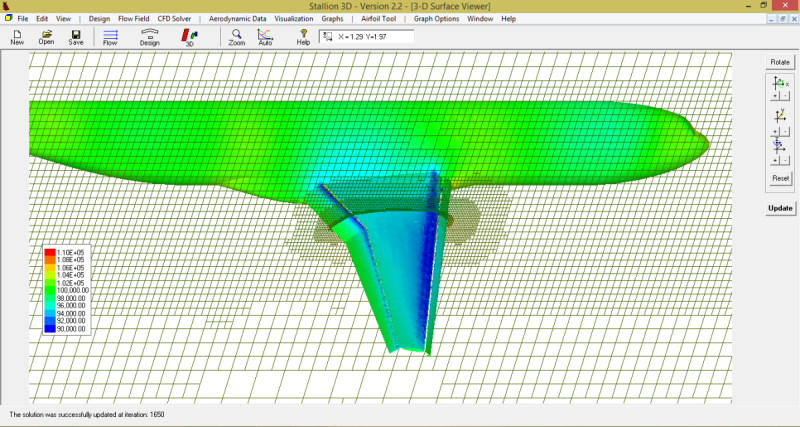 Undoubtedly, Stallion 3D is the easiest CFD program on the market. You never again have to overlay additional grid shapes, add points, subtract areas, build-up bumps, eye-ball, or cross your fingers to increase accuracy when generating your mesh. Admittedly, all the mention of future computing hardware possibilities, mentioned in the 2030 AIAA presentation was enough to make anyone drool. Today, though our children may not be impressed with computers, us over 50 years old, personally know how far hardware has progressed beautifully . Once your simulation has finished your simulation, all the pertinent results are automatically tabulated for you. 3. 3D CFD simulation performed using Stallion 3D. Please visit http://www.hanleyinnovations.com/stallion3d.html. Prices start at $890. Please visit http://www.hanleyinnovations.com or telephone (352) 240-3658 for more information.